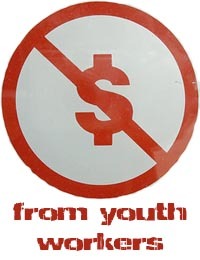 In my opinion, the youth volunteers should never pay a dime for anything ministry related, regardless of their income. They’re already sacrificing their family time, work time, relax time, friend time, sleep, energy, etc — that’s payment enough. I try to make it easy for the leaders to go on trips because if they can’t go, neither can the kids. Instead, I suggest splitting all the youth leader’s fees between the kids going on the trip: the cost of the trip for everyone divided by the number of students attending. For example, if a trip costs $50/person and there are 10 students going and 4 leaders, I take $50×14=$700 and divide that by the 10 kids, so now the trip costs $70/student and leaders go free. Besides making it easier for the volunteers, it shows them that you appreciate their sacrifice and dedication to the students. Even if a leader wants to pay, don’t let them. That way there’s absolutely no pressure on any other leader to pay also. If some leader demands that they make some sort of financial contribution, ask them to sponsor one of the students instead. Now, I don’t really make this “formula” public to everyone when announcing the cost of trips and events. I just tell them what it costs and leave it at that, especially if no one is used to the slightly inflated prices. If someone asks, tell them the truth and back your volunteers 100% with this. Make it clear that if the leaders don’t go, then no one can go at all. Your leaders are the ones who make the trip possible for everyone, the ones sacrificing so much personally and giving so much to the kids during that time. The least the kids can do is cover the extra money to get them there. Your leaders are the ones who make the trip possible for everyone, the ones sacrificing so much personally and giving so much to the kids during that time. The least the kids can do is cover the extra money to get them there. Unfortunately there’s an attitude in many churches that expects programs to be offered either free of charge or at minimal cost. Those same parents have no problem forking over $200 for a band uniform or paying for their kid’s sports leagues because they deem those programs to be valuable. How much more valuable are their kid’s spiritual development? In most cases, raising the price a little won’t affect anyone, as much as their outcry may indicate otherwise. Every marketing study out there shows that students are the #1 targeted demographic because they spend more money than anyone else and have the least amount of financial responsibility. The question isn’t usually whether students have money or not, the question is how they choose to spend it. If they’d stay home one Friday night instead of going out to eat and seeing a movie with friends, that’s almost an extra $20 right there. When my students committed to support one of our church’s missionaries, it was like pulling teeth to get them to meet their $30 pledge every month. But if I announce something about paintball, every kid immediately has $40 and is ready to go. So, to answer your question, don’t ask the leaders to pay for anything. Cover their gas, meals, lodging, 100% of any youth ministry related expenses. Charge the kids a little extra to cover it. Give each of your leaders a hug in the process for making the trip possible and let them know just how much you appreciate their sacrifice and dedication to the students.